Hello! I realised that I haven’t posted anything in a month even though I have a few drafts waiting to be finished so I thought I better get cracking! 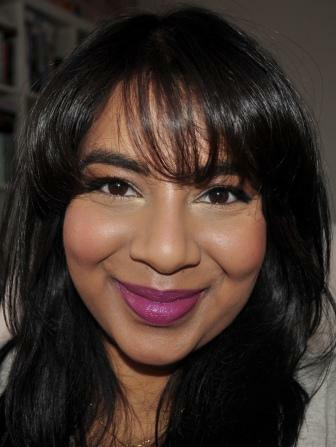 For my first post for this month I thought I’d talk about one of my favourite makeup brands: NARS! I love NARS blushes and even though there are so many other great brands on the market that produce really great blushes, in terms of quality and pigmentation, NARS blows them all out of the water. If you have any experience with NARS blushes then you’ll know that their intense pigmentation means that you can end up looking crazy if you don’t use a light hand. This always ends up being a problem for me because I’m always running late and I find it impossible to apply my NARS blushes without having the time to go slow with them. That was of course until I bought the NARS Yachiyo brush. I can see that this brush is going to reach HG status for me because it makes pigmented blush application a no brainer! It’s one of four brushes from the NARS Kabuki Artisan brush collection which are all based on traditional Japanese brushes that Geisha and Kabuki actors use. I’ve purchased 3 out of the 4 brushes so far and will be reviewing them all in individual posts. Here’s a great blog post that explains all the brushes and their uses in traditional Japanese culture and compares the traditional versions with the NARS versions of the brushes. 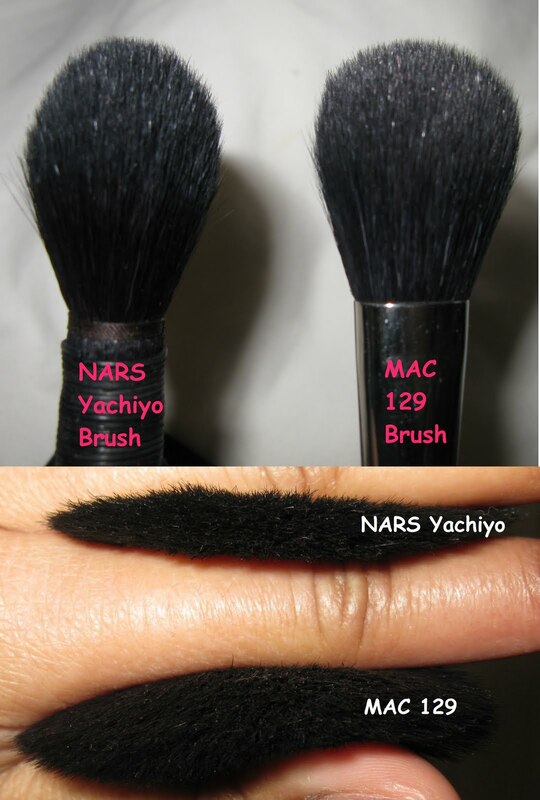 The NARS Yachiyo’s handle is wrapped in black wisteria and you can see from the pictures below that it’s not your run of the mill blush brush. 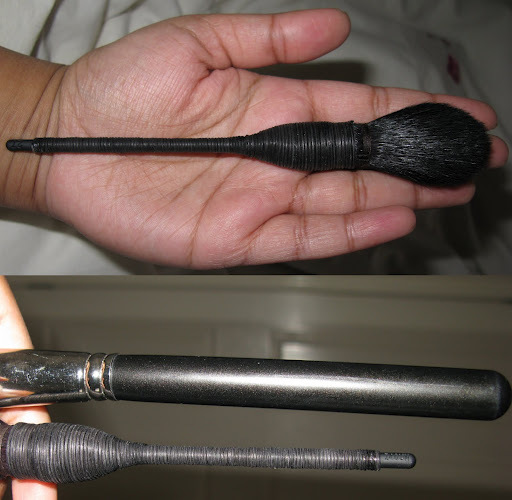 The second picture is a comparison with my MAC 129 blush brush. Although the shape of the brush and its handle may look awkward, it’s actually really comfortable to use. It’s a very light brush and feels quite fragile and breakable but I think that’s just because I’m used to big sturdy brushes. I’m fairly certain the bristles are made of ‘super’ goat hair like the rest of the brushes in the Artisan range but I’m not 100% sure. Now I don’t know what differentiates normal goat hair and super goat hair but it’s a very soft brush even though it’s probably not the softest I own. Here are some pictures comparing the shape of the brush head and the density of the brush to the MAC 129 brush blush which has a shape typical of a standard blush brush. As you can see, the Yachiyo brush is not as dense as the MAC 129 and the brush head is alot more rounded than the MAC brush. I think these two main differences are what makes this brush ideal for the sheer application of pigmented blushes. The lower density means that the brush doesn’t have as many hairs to pick up colour and it also means it diffuses the colour a lot more. The rounded shape also means that a smaller surface area of the brush is actually touching the product. I can talk about it all I want but you’ll understand it alot more if you see pictures of it in action. 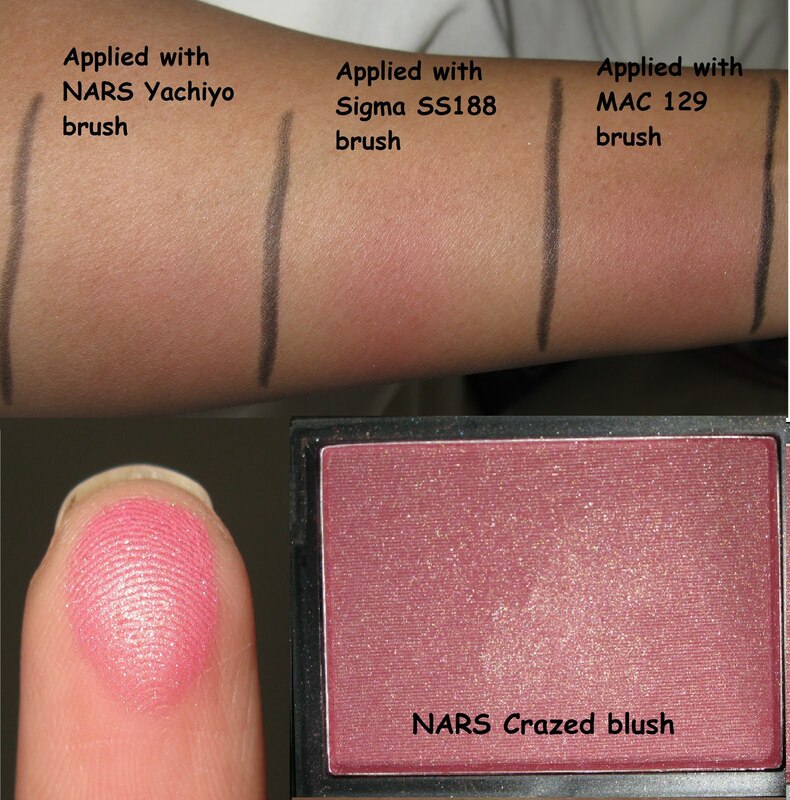 For the swatches below I used my NARS Crazed blush which (as the name suggests) can give you a very crazed look if you don’t go easy with applying it! My flash bleached out the colour a bit in the swatches but you should still be able to tell that the swatch applied with the NARS Yachiyo brush is alot sheerer and more diffused than those applied with either the Sigma SS188 ( a stippling brush) or the MAC 129 brush. Don’t get me wrong, I still like these other brushes but I just use them for my blushes that aren’t so crazy pigmented! I find that since I purchased this brush, I have been using my NARS blushes quite alot more even when I’m running late. I’ve also found that this brush is just perfect for cream blush application and I even like the way it applies my MUFE HD blush so this is definitely a keeper! I also ordered the brush by Japonesque that looks very similar to this brush and I’ll be doing a comparison post once I receive it. If you’re looking for a good blush brush and are willing to fork out a quite a bit of cash, I think this brush is definitely worth getting. I would advise going to your closest NARS counter and getting a feel for the brush first if you can but I honestly don’t think this will be a purchase you’ll regret! I finally did a comparison post between the NARS Yachiyo and the Japonesque version. Just CLICK HERE. Did you purchase this brush from mecca cosmetics or online? Hi there! I purchased this brush and the Botan brush from ebay but there was only one of each from the sellers I purchased from. The majority of Botans on ebay seem to be fake so be careful when purchasing. I was initially going to purchase from Mecca but after looking at the price compared to the US prices I decided to pass!